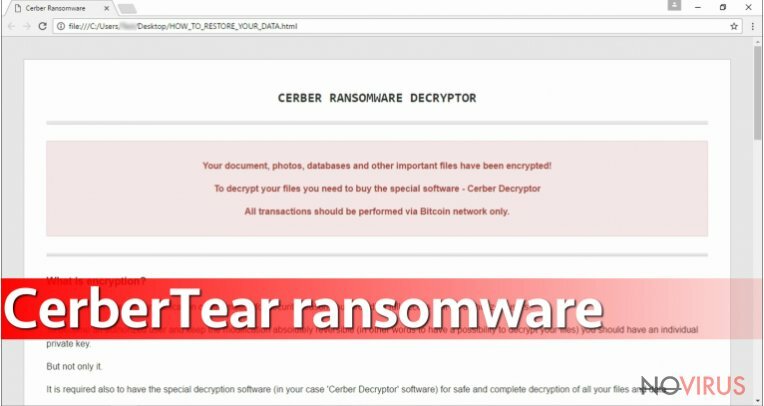 CerberTear ransomware virus: copycat or a real threat? CerberTear virus tries to make computer users believe that it’s a new version of the dangerous and well-known cyber threat. Even though some new Cerber’s versions has been recently released, this malware has nothing in common with them. Well, it only appends .cerber file extension to the encrypted data and offers to decrypt files using Cerber Ransomware Decryptor. It seems that developers of CerberTear ransomware are actually lazy. Apart borrowing the name, they also used HiddenTear’s code. It was an open-source and educational ransomware project. As you can realise, hackers decided to use this code for their good, and after few modifications, they launch another blackmailing tool online. Cyber criminals try to swindle the money from innocent computer users by taking their files to hostage. They demand 0.4 Bitcoins for data recovery solution. It‘s relatively small ransom; however, we do not recommend giving your money to the criminals. Even if they provide the necessary software, it may be corrupted or install additional malware along with decrypted files. Instead of transferring the ransom, remove CerberTear from the computer with the help of Reimage or other reputable malware removal program. Any attempts to get back your files with the third-party tools can be fatal for your encrypted files. The most part of the third-party software change data within the encrypted file to restore it but this causes damage to the files. Keep in mind that it’s only psychological terror. Cyber criminals know that users rarely back up their personal files, so losing them seems like the end of the world. However, if you have data backups and store them in external devices, you don’t need to worry about paying the ransom. Just initiate CerberTear removal, connects USB or another device to the computer and copy your files. Though, you can use additional data recovery methods presented at the end of the article. But don’t forget to remove malware first! CerberTear malware is not the only file encrypting virus spreading all around the net. Thousand different viruses try to get inside computers to cause havoc and panic. Ransomware spreads as a safe looking document attached to an email. Usually, developers name these files as official documents, bank statements, invoices, CV and so on. Crooks pretend to be from reliable, well-known and official institutions and inform about some serious issue. However, before opening any email attachment, look attentively to the sender’s email address and think if it can be real. Double check the information online or contact the institution directly. Keep in mind that checking information takes less time than ransomware elimination. Ransomware-type viruses are dangerous cyber threats, so you should not consider manual CerberTear removal. It’s almost impossible. Dedicate this job for professional malware removal tools such as Reimage or Malwarebytes MalwarebytesCombo Cleaner. Before starting malware elimination, look through our prepared guidelines below. The virus may prevent from accessing anti-malware or antivirus programs, so you will need to reboot the computer to the Safe Mode with Networking. If you encounter any difficulties, don’t give up because it is still possible to remove CerberTear from the system! Sign in to your account and launch any Internet browser. Download a legitimate anti-malware software, for instance, Reimage. Make sure you update it to the latest version and then run a full system scan with it to detect and eliminate all malicious components of the ransomware to remove CerberTear completely. In a new window that shows up, click the Next button and choose a restore point that was created before the infiltration of CerberTear and then click on the Next button again. After restoring the computer system to an antecedent date, install and check your computer with Reimage to uncover any remains of CerberTear. Using the tutorial provided above you should be able to eliminate CerberTear from the infected device. novirus.uk team has also prepared an in-depth data recovery guide which you will also find above. If you have been infected with CerberTear ransomware virus, do not rush paying the ransom. If you have data backups, restore files from them. If you don’t have them, after virus elimination try additional data recovery methods presented below. A well-known malware researcher Michael Gillespie has created a tool that helps to restore files encrypted by HiddenTear and all its versions. Therefore, do not hesitate and download it now. It is strongly recommended to take precautions and secure your computer from malware attacks. To protect your PC from CerberTear and other dangerous viruses, you should install and keep a powerful malware removal tool, for instance, Reimage, Malwarebytes MalwarebytesCombo Cleaner or Plumbytes Anti-MalwareMalwarebytes Malwarebytes. This post was published on 2016-11-22 at 15:18. Category: Ransomware, Viruses. What method did you use to remove CerberTear virus?